A Travel Expense Report is an organized way for businesses and their employees to track and report their expenses for business-related trips. The expense report is usually a printed form or a spreadsheet that is filled out and kept for accounting and tax purposes. Because of this, it is especially important to track any expenses that are tax deductible. For a quick solution, instead of making your own expense report in Excel or Google Sheets, download and use our free Expense Report Template below. Easily customize it by adding your company information and other details, then share it with your employees. Important Note for Employers: When your employees use this travel expense report, they should also submit copies of receipts along with the report so you can keep adequate records for tax purposes. A note like "Don't forget to attach receipts" in the spreadsheet can help serve as a reminder. Report your travel expenses, especially those that are tax deductible, with a simple and easy-to-use spreadsheet. 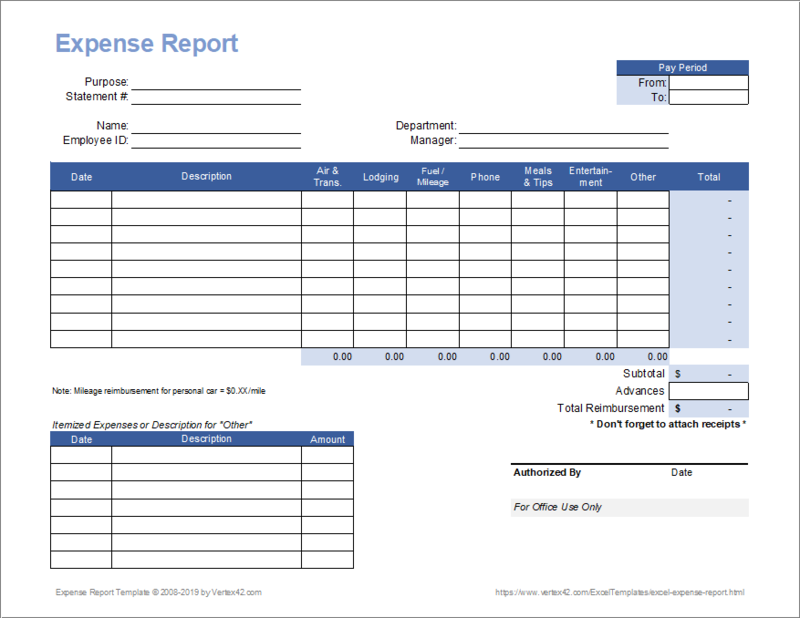 The report template includes separate columns for common types of expenses. It also includes a table for recording detailed itemized expenses, such as a break-down of your meals or transportation expenses. What business travel expenses are tax deductible? Our Reimbursement Form template is great for general employee expense reimbursements (for non-travel expenses). The Business Mileage Tracking Log lets you keep track of daily mileage for record keeping and reporting. The Weekly Expense Report template provides a way to include more details and more expense categories. Disclaimer: The information on this page is for general education and not to be used as personal financial or tax advice. If you have questions about taxes or proper reporting procedures for travel expenses, please consult a certified professional.